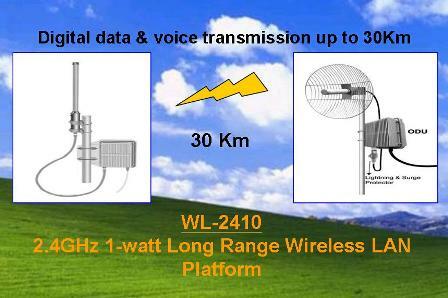 Digital long-range wireless transmission for data and voice. Extending LAN, VOIP, phone, Internet…data, image, voice up to 30Km. Combining usage of WEB related equipments like VOIP, camera… for versatile applications. Advantages especially great in those areas lacking of well broad-band infrastructure.